Take KUVAN® Tablets or Powder for Oral Solution exactly as your doctor tells you. Please see KUVAN Instructions for Use. KUVAN Powder dissolves completely in 15 seconds in water, apple juice, or a small amount of soft food such as apple sauce or pudding. Watch the video below for step-by-step instructions on how to take KUVAN Powder. Living a healthy, productive life with PKU is possible. However, it is important to remember that PKU is a serious disease requiring lifelong management. Here are some keys to success to achieve a goal of Phe control. Track your Phe intake by keeping a food diary. The diary helps your dietitian see how much Phe you consume over several days. The dietitian uses that information to adjust the low—Phe diet and Phe—free medical foods as needed. So it’s very important to accurately record what—and how much—you eat and drink each day. 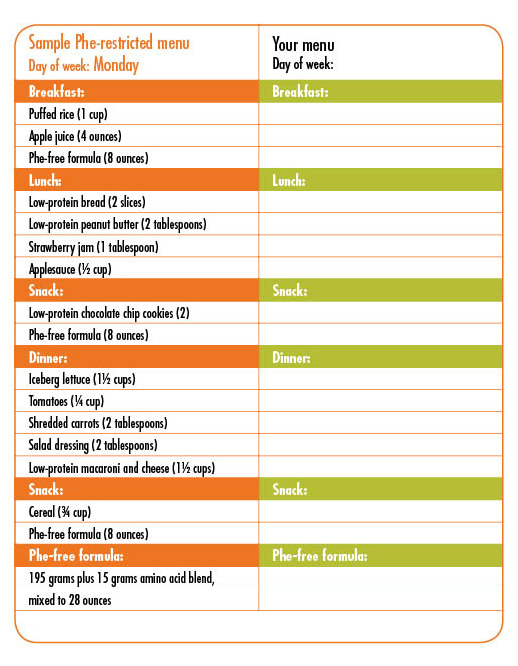 Download a sample food diary showing a 1-day menu for a low-Phe diet. Download a 3-day diet record to write down your food and beverage intake, which is a dependable way to determine your Phe intake. Learn the facts about KUVAN® (sapropterin dihydrochloride) Tablets or Powder for Oral Solution. Then talk to your clinic team. Together, you and your clinic team can decide if KUVAN is the right choice to help you manage your PKU. Plan ahead. Whether you are going across town or on vacation, these travel tips may come in handy. Find out as much as possible about the place you are visiting, especially if it is a foreign destination. How clean and safe is the water? Will you be able to keep your formula cold? Help your child’s teacher understand PKU. Download a brochure that provides important information that a teacher—or anyone caring for your child—should know about PKU and the low-Phe diet. KUVAN® (sapropterin dihydrochloride) Tablets for Oral Use and Powder for Oral Solution are approved to reduce blood Phe levels in people with a certain type of Phenylketonuria (PKU). KUVAN is to be used with a Phe-restricted diet. It is not possible to know if KUVAN will work for you without a trial of the medicine. Your doctor will check your blood Phe levels when you start taking KUVAN to see if the medicine is working. Starting KUVAN does not eliminate the need for ongoing dietary management. Any change to your diet may impact your blood Phe level. Follow your doctor’s instructions carefully. Your doctor and dietitian will continue to monitor your diet and blood Phe levels throughout your treatment with KUVAN to make sure your blood Phe levels are not too high or too low. If you have a fever, or if you are sick, your Phe level may go up. Tell your doctor and dietitian as soon as possible so they can make any necessary changes to your treatment. Children younger than 7 years old treated with KUVAN doses of 20 mg/kg per day are at an increased risk for low levels of blood Phe compared with children 7 years and older. Frequent blood monitoring is recommended in this population to ensure that blood Phe levels do not fall too low. Tell your doctor if you have ever had liver or kidney problems, have poor nutrition or have a loss of appetite, are pregnant or plan to become pregnant, or are breastfeeding or plan to breastfeed. KUVAN is a prescription medicine and should not be taken by people who are allergic to any of its ingredients. KUVAN and other medicines may interact with each other. Tell your doctor about all the medicines you take, including prescription and over-the-counter medicines, vitamins, herbal and dietary supplements. If you forget to take your dose of KUVAN, take it as soon as you remember that day. Do not take 2 doses in a day. If you take too much KUVAN, call your doctor for advice. The most common side effects reported when using KUVAN are headache, runny nose and nasal congestion, sore throat, diarrhea, vomiting, and cough. Additional adverse reactions reported in connection with worldwide marketing include sore throat, heartburn or pain in the esophagus, inflammation of the lining of the stomach, indigestion, stomach pain, nausea, and nose irritation. These are not all the possible side effects seen with KUVAN. Call your doctor for medical advice about side effects. You may report side effects to FDA at 1-800-FDA-1088. Too much or constant activity (hyperactivity) can happen with KUVAN. Tell your doctor if you have any signs of hyperactivity, including fidgeting, moving around or talking too much. For more information, call BioMarin RareConnections™ at 1-877-MY-KUVAN (1-877-695-8826). Please read the full Patient Information by clicking here. KUVAN® is a registered trademark of BioMarin Pharmaceutical Inc. Developed in collaboration with Asubio Pharma Co., Ltd.